The goats are being moved to the Cascade Mountains, their native habitat. The state expects to relocate half the estimated 700 goats on the Olympic Peninsula. The remainder will be killed. 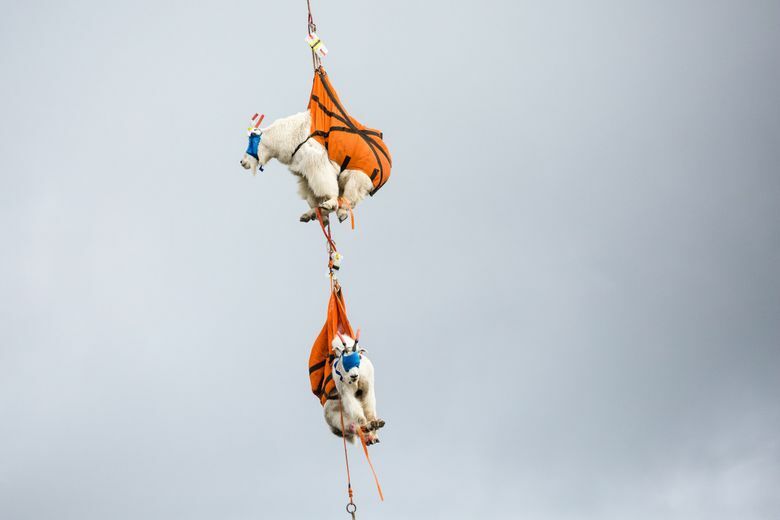 OLYMPIC NATIONAL PARK — Dangling from a rope beneath a helicopter and wearing blindfolds, the three mountain goats descended slowly from the air into the bed of a pickup truck. A flurry of people wearing medical gloves and helmets guided the goats and gently pinned them down. Earlier, the wild animals had been shot with either a dart or a net fired from a gun. Then, a handler known as a mugger jumped from the helicopter, calmed the animals and attached them to a sling to fly from the park’s Bailey Range to Hurricane Ridge, where a crew of veterinarians and volunteers had gathered. The goats are among the first to be removed from the mountain range as part of an effort to rid the Olympics of the nonnative ungulates that national park officials believe ruin park vegetation and pose a threat to visitors. Atop park picnic tables, veterinarians put the animals through a battery of medical tests, including having their blood drawn and stool sampled. They were tagged and fitted with GPS collars. Then the goats were loaded into narrow specialty crates and into a refrigerator truck for transport to the North Cascades mountain range, soon to be their new home. Wildlife officials hope the transported goats will boost a reduced population of mountain goats living in their native habitat of the Cascades. Olympic National Park officials estimate that they will be able to capture about half the estimated 700 goats living on the Peninsula. The remaining goats unable to be captured will be killed. Mountain goats predate the park’s designation. Twelve mountain goats were brought by a hunting group to the Olympics from British Columbia and Alaska in the 1920s, according to park officials and newspaper clippings. They multiplied into hundreds. In 1938, Franklin D. Roosevelt signed an act to make the Mount Olympus National Monument a national park. Officials became concerned about aggressive goats after a rare mountain-goat goring killed a 63-year-old hiker in 2010. 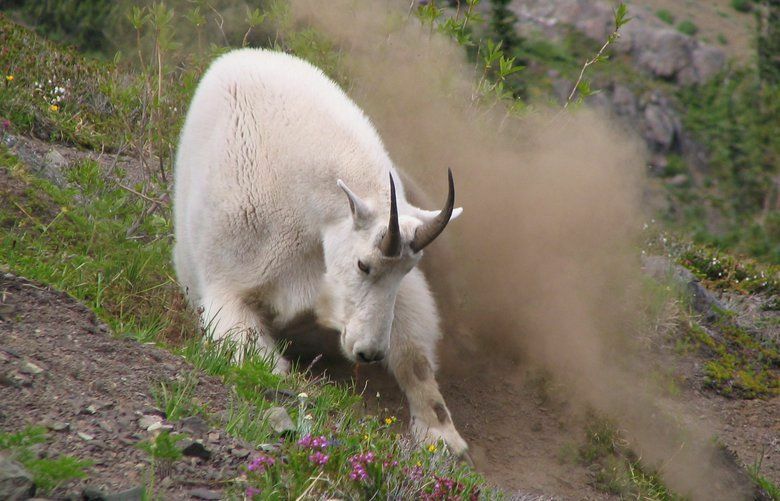 Mountain goats are known to seek salt from hikers’ sweat and urine. Olympic National Park does not have natural salt sources, and that likely increases interaction with people. Park officials say removing the goats will help restore the park’s ecology to its original state. “We will have removed an exotic species that has impacts on fragile ecosystems,” said park Superintendent Sarah Creachbaum. By the time the mountain goats reach their new home in the Cascades, they will have traveled by helicopter, truck and ferry. Volunteer drivers have been shuttling the goats east in refrigerated trucks to several sites in the North Cascades, where the Washington Department of Fish & Wildlife is in charge of efforts to deposit the goats in new homes. Near Stillaguamish Peak Tuesday, the agency and its partners managed to relocate 11 goats. For most of the creatures, a helicopter swooped in and picked up their crates, two at a time, before dropping them off at a high elevation. When the weather turned and poor visibility stopped the helicopter from flying, other goats were driven to a lower location nearby. Once free, animals galloped from their crates dazed and somewhat bewildered by the ordeal and their new home. WDFW biologist Rich Harris, who has coordinated the agency’s involvement in the project, said the influx of goats should make populations healthier there, but the effort would take time.